We can reduce the overwhelm, knowing what you prefer + what works for you is the key! We keep notes on things to do, see, buy, eat + read, things that inspire us to create + change, along with information on things we are learning + planning. There’s a lot we keep track of and so we need a way to organise notes that helps us get things done. As technology + life changes so to do the places where we take notes. With mobile devices becoming an integral part of our lives we have both physical + digital notes to organise. We have notes on our computers, in devices, on sticky notes stuck to our computers, in notebooks + folders, and on random pieces of paper, covering our desk and filling our draws. We can reduce the overwhelm of finding what we need when we need it by setting up specific places for taking notes. Knowing what you prefer + what works for you is the key. As I looked at my notes I discovered some guiding preferences I use for organising my notes. For planning I use paper + for recording information + writing I prefer digital. I prefer paper for fleshing out ideas as I feel more connected to what I’m doing. My preference is for a ring bound A5 binders. One for planning and another as a daily planner. I like to be able to move my pages around and take them out when I’m finished. Planner binders are great for a more traditional diary, bullet journalling + more. They are robust and travel well. The fact that they look gorgeous is a bonus! My planning planner is home for content + product ideas, website updates + my vision. The daily planner is the home for todo lists, places we want to go, movies to see, books to read, jobs around the house etc. It’s the one I use for our family meetings. I have a personal size planner for reference information on keyboard shortcuts, colour palettes, printing tips and such. It’s the perfect size for using 6×4 pocket cards. I also have another as a faith + gratitude planner. I love this space for getting creative, easily adding photos, washi tape, paint + stickers. I’ve recently started using the disc system for creating workbooks. It’s super flexible for adding pages as needed. Then there are my digital notebooks. I have used Mac Journal since 2005 for my daily journalling, book notes + things of a more personal nature. And I use Evernote, a digital app, for writing, web links + other information I want to refer to later. With much of my research taking place online it is easy to copy or drag a link into Evernote, tag it + find it when I need it. There is an abundance of ways to organise notes, both physical + digital. So let’s dive in and find out what what works for you. 1. ” Collect : make a list of all the places you currently take notes. Mark next to each one what kind of notes you are keeping in each place. 2. # Reflect : next we find our best solution for organising notes by answering the following questions. Think about all the places you have written down, do you prefer paper, digital or are you a combination of both? Have a look over your list, can you reduce the number of places you collect notes? What do you enjoy using to take notes? Would you benefit from using a combination of paper + digital apps? If so, which would work best for each kind of note? Do you want different places for personal + business notes? Make a new list of the places you want to be using + for which kinds of notes. Do you want to use a notebook, planner binder or sticky notes? Will your note books or binders need to be the same size? Would you like to bullet journal or sketch note and benefit from grids + dots rather than lines? What dividers will you need to separate sections in your planner or folder? Do you want to be able to create a variety of notebooks in a single app? Would you like to tag entries for easier searchability? Do you want to create notes + todo lists in the one app? 3. > Connect : this is the fun bit where you get to dive in + set up a system that works uniquely for you. It’s time to shop for a note taking app or you could use the free version of Evernote. Set yourself up different notebooks, and if using Evernote make yourself a list of tags that you will use. 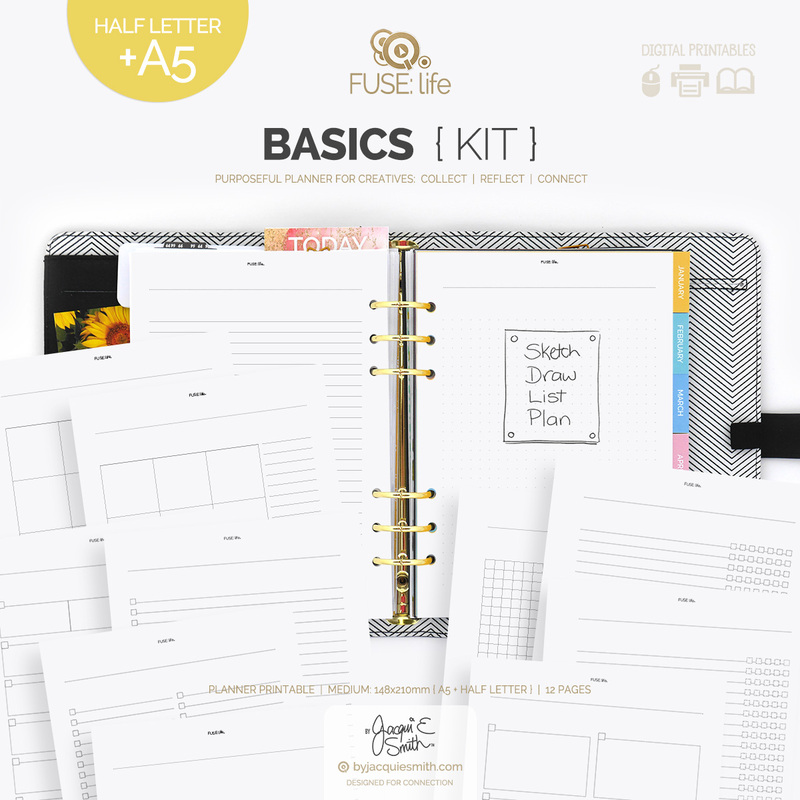 Pop over and shop the FUSE:life Basic planner printables kit to set up your own gorgeous note planner, in three popular sizes. With a variety of basic page designs you can bullet journal, sketch note, make lists + more! Grab your FREE planner printables + creative goodies + join our community!